Hello everyone once again to another edition of Mastication Monologues! Today I will be talking about a few different types of food that I tried over the weekend. 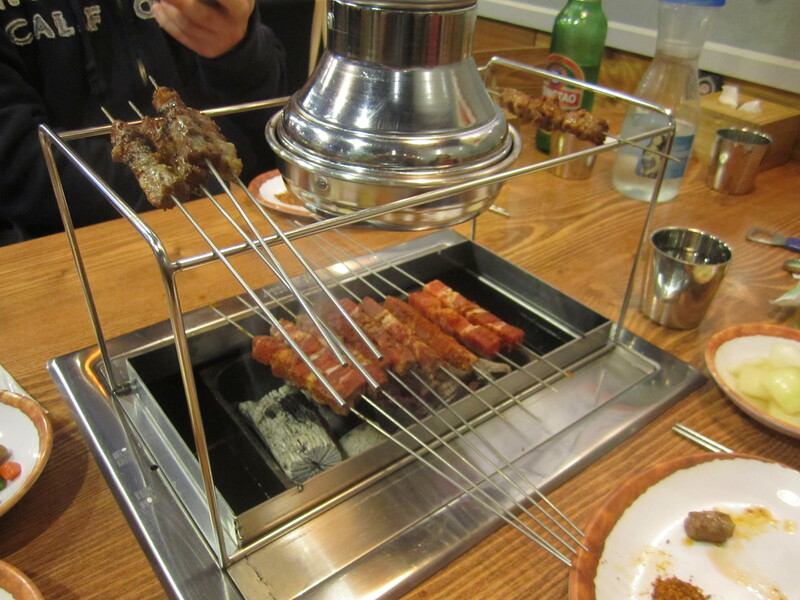 The first was samgyeopsal which is part of the litany of things that Koreans love to barbecue. They’re basically large strips of bacon minus the seasonings, but they taste so delicious no matter what. 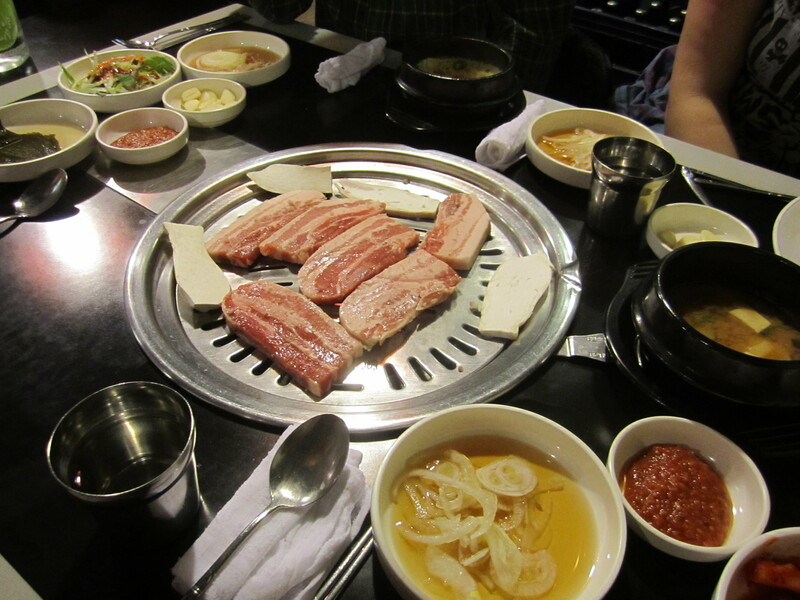 While the bacon was sizzling on the grill, we had plenty of different types of banchan or side dishes to try. I passed on the macaroni salad, but I did enjoy the fresh tofu jjigae or tofu soup. We also threw a couple cloves of garlic on the grill to give the bacon a bit more of a savory flavor. After about ten minutes, we had our pieces of bacon cut up with the scissors they give you when you sit down. You can take each piece and put some of the onion vinegar sauce on it or perhaps some of the red chili sauce depending on if you want it spicy or not. Then you put it in a pepper leaf or a lettuce leaf and enjoy your delicious wrap. They also gave us pieces of what we assumed were mushrooms to also grill since they had an almost meaty aftertaste mixed with earthy overtones when consumed. Going from one type of meat to another, the following night I met up with friends in Gangnam to try Chinese lamb skewers at Gayang located at 강남구 역삼 1동 817-21 . It was a very anonymous place that really didn’t have a line out the door like some of the other bbq places, but this grilling dinner was a bit different. Instead of just doing the usual Fred Flintstone method of grilling with slapping big pieces of meat on hot metal, we were doing more of a marshmallow method of grilling. We got four total portions of skewers since we were quite hungry, but it’s not the cheapest meal out there at 10,000 won per serving. However, you get roughly ten skewers, and the experience was worth it. The lamb grilled up nicely with very little fat, and it came with a dry chili based rub that had clear cumin elements with a little garlic. The banchan was pretty typical, but I did enjoy the boiled peanuts and the sweet onions. If you’re looking for something a bit different from Korean bbq, check out the Chinese lamb place in Gangnam. The final part of this food trilogy entry deals with a spur of the moment food encounter. After going to a couple bars in Gangnam, my friend Steph and I decided to try some street food at one of the stalls in the alley. They were doing good business, so we just picked a mix of different fried foods. 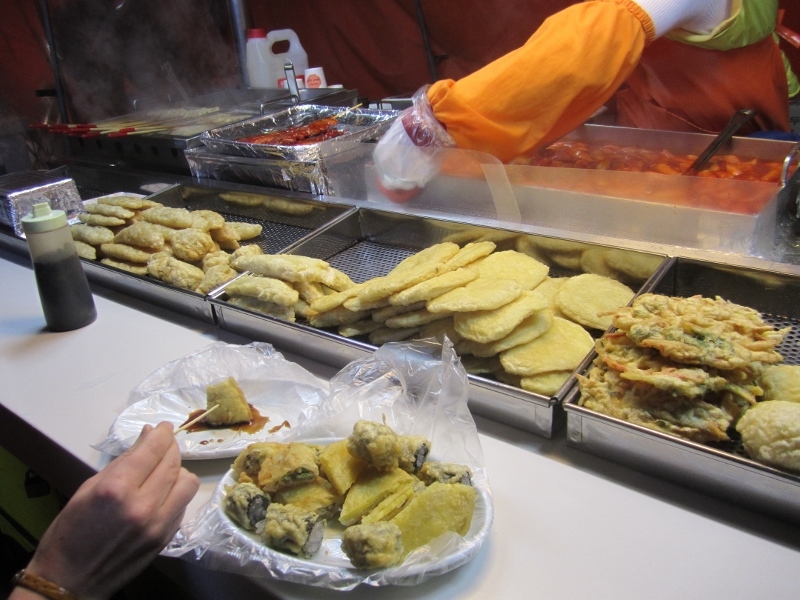 We ended up having deep fried kimbap (rice rolls), deep fried plantains, and fried meat dumplings. The kimbap were ok with small glass noodles, but the meat dumplings were decent since the meat had a great seasoning blend that made it taste like shepherd’s pie a little bit. However, the flat pancake plantains were the best since they tasted like sweet potatoes but were almost too sweet. We still aren’t sure what they were, but we were happy to experience an authentic part of Korean culture. 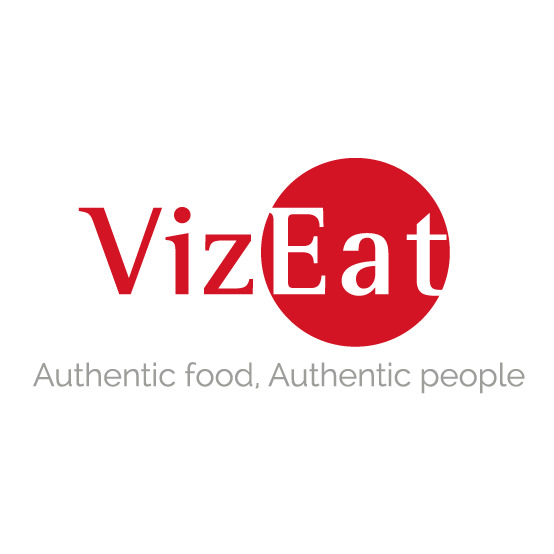 Posted in Chinese, Far East Asian Cuisine, South Korean and tagged authentic, bacon, Chinese, dining, dry, Food, fried, grill, kimbap, lamb, mushroom, onion, peppers, plantain, restaurant, Reviews, rub, shishkabob, skewer, South Korean, spicy. Bookmark the permalink.